CrimLaw: Can an Officer Enter a Residence to Arrest a Suspect? Can an Officer Enter a Residence to Arrest a Suspect? I am constantly getting asked what the parameters are when a defendant is in a house and officers are seeking to arrest him. Then I always get dubious looks when I say, "Officers can do X, Y but not Z." So, I thought I'd look at it one more time and write it down here so I can tell people where to go to find information on entering a house. The foundation of any discussion on entering a home is Payton v. New York, OCT79, USSC No. 78-5420. In Payton the Federal Supreme Court struck down a New York statute that allowed officers to enter a residence without a warrant to make a felony arrest. In terms that apply equally to seizures of property and to seizures of persons, the Fourth Amendment has drawn a firm line at the entrance to the house. Absent exigent circumstances, that threshold may not reasonably be crossed without a warrant. Payton made it clear that officers couldn't enter a residence to seek a suspect, absent the usual exigent circumstances (defendant will escape, defendant will harm self or others, defendant will destroy evidence), unless they had a warrant in hand. This case probably more sited for its converse aspect: if an officer has a warrant he may go into the residence to get the suspect. As with any foundational case, this case led to a series of subsequent cases answering cases which refined the holding. These are the major questions that I know have been answered so far. Can an officer with an arrest warrant enter a third party's house in order to arrest a suspect? No. An arrest warrant does not allow an officer to enter the house of a 3d party in order to get the suspect.. Steagald v. U.S., APR81, USSC No. 79-6777. Of course, there are exceptions to this if there are exigent circumstances or consent. In all other circumstances the officers must get a search warrant to search a third party's residence. However, while this definitely protects the resident, the entry into the 3d party's residence is not a violation of the suspect's rights and he probably wouldn't be able to use this as a defense. See e.g. U.S. v. Willis, SEP10, USDC EDVa No. 3:10CR186-HEH. What if an officer is trying to arrest a suspect and she runs back into her house? If a person is in public, including the open doorway of her house, and the officers engage in an attempt to arrest her, the officers are not required to stop at the door when the suspect retreats into the house. U.S. v. Santana, JUN76, USSC No. 75-19. It is considered a "hot pursuit." 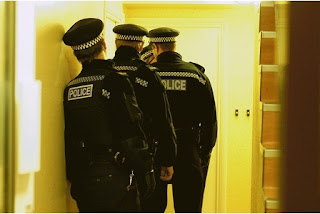 Thus, during the Saturday night fun and games, when officers respond to a call about Bob being drunk again and Bob opens the door and spits at them, it's constitutional when they break the door down to get him. Can officer just enter the suspect's residence as long as they have an arrest warrant? No. There is a test as to (a) whether this is the suspect's residence, and (b) whether the suspect is in the residence. However, there is a difference of opinion as to what level of proof the officers must have of these two factors. The older standard is the one first laid out in U.S. v. Magluta, FEB95, 11Cir No. 93-5069. We think it sufficient to hold that in order for law enforcement officials to enter a residence to execute an arrest warrant for a resident of the premises, the facts and circumstances within the knowledge of the law enforcement agents, when viewed in the totality, must warrant a reasonable belief that the location to be searched is the suspect's dwelling, and that the suspect is within the residence at the time of entry. The reasonable belief standard seems to be the one that is adhered to in most jurisdictions, but in a minority of jurisdictions the standard is probable cause. The case which begins this line is U.S. v. Gorman, DEC02, 9Cir No. 02-50053. We now conclude that the "reason to believe" standard of Payton and Underwood embodies the same standard of reasonableness inherent in probable cause. I cannot find any Virginia cases which decide this question. However, it seems to me that the Courts Appellate Virginian would almost certainly follow the majority and adopt the lesser reasonable belief standard. Can an officer enter a suspect's residence if he has a misdemeanor arrest warrant for the suspect? Yes. People just don't want to believe an officer can enter a residence to arrest someone on a misdemeanor warrant and often law enforcement agencies have policies against doing so. Additionally, there is an argument that since Payton struck down a statute allowing entry without a warrant to make a felony arrest that the converse aspect of that decision is that officers can enter with a felony arrest warrant - not a misdemeanor arrest warrant. However, this interpretation of Payton has been roundly rejected. The case which sets forth the interpretation of Payton allowing entry with a misdemeanor warrant is U.S. v. Spencer, JUL82, 2Cir No. 81-1493. The decision points out that no matter the language of the rejected statute, the court in Payton speaks of arrest warrants generally, not distinguishing felony warrants and misdemeanor warrants. It concludes that the general language includes all arrest warrants (felony, misdemeanor, and bench) and therefore an officer with any arrest warrant can enter a residence. Every opinion I have found addressing this issue adopts the Spencer reasoning and allows officers to enter residences when they have a misdemeanor warrant in hand. In fact, Virginia takes it a step further. In Archer v. Commonwealth, NOV97, VaApp No. 1726-96-1, the Virginia Court of Appeals approves entry when the officer knows of the existence of an arrest warrant, even if he does not personally have it. So while the officers decide what they can and can't do, the person is half way out of the window to avoid arrest. Nope. Officers are smart enough to get the warrant before hand or have enough officers there to cover the exits while they call for one. C'mon Ken...I'm not expecting formal Bluebooking or anything, but some useful citations might be helpful. Also, check U.S. v. Torrance Hill, 649 F.3d 258 (4th Cir. 2011), for a recent discussion of this issue. The Court mentions the circuit split over "reason to believe" versus "probable cause." Sorry. I'll use "page numbers" when i have to (in court briefs), but identifying cases we all look up on the computers in modern times by page numbers is just ridiculous. The quickest way to look up a case online is to use the case number. This is especially true if you are using a service other than Lexis or Westlaw (my favorite when in private practice was VersusLaw and now I use, free via the Bar, Fastcase). My citation form is better. I only wish that the courts would start numbering their paragraphs for even better citations. Name v. Name, Date, Court Case Number. I am sorry that the names aren't underlined or italicized. I tried to get the blog to do it three time, but apparently there is something in the current format which removes the markups. The problem with this right is that there is no remedy -- unless you are guilty. Late one evening, at 2 a.m., I was awoken by a knock on my door. It turns out that a long-ago ex-girlfriend had claimed (falsely) that that evening we had been together and I had hit her. At my door were four police officers who only wished to "ask a few questions." I said that I would not allow them too enter my apartment. They asked if I would open the door so we could talk without their shouting -- which they were unnecessarily doing in the hallway, risking embarrassment in front of my neighbors. I said that I would open the door, but only to facilitate a conversation, and they needed to expressly agree that I was not giving them consent to enter. They agreed. Sure enough, though, a few minutes later they decided that they had enough evidence (i.e., my denial) to arrest me on misdemeanor assault charges. I said to them that I didn't think they could enter my apartment without my consent, and that I would not consent. They responded that if I did not agree to "voluntarily" let them enter my apartment, that they would forcibly enter and forcibly take me to the police station in my bathrobe. But, if I allowed them to enter and watch that I didn't obtain a weapon, they would allow me to dress. At that point I said "you can enter only for the point of watching that I don't have a weapon when I get dressed." They agreed and, promptly, all four entered and began conducting an invasive search of the premises (looking behind books, etc. ), which produced nothing whatsoever. So what's my remedy? The only effect of a motion to quash the arrest, is that any statements made between the time of the arrest and my arrival at the police station (there weren't any) would be quashed. It would not have dismissed the criminal case. Today, since the criminal case has been dismissed and sealed I could, I suppose, commence a Bivens action -- after a few years I would get a few dollars for the trespass, and the cost of it, to me, would be that the sealed case would become public knowledge. So for innocent people, the right is useless. The only people who have an effective remedy, are people where the police find something during a search incident to the illegal arrest, etc. Illegal to Marry After a Divorce in Virginia?